Texola Route 66 Texas State line Marker. My name is Corkey Mayberry and my wife's name is Gerry Mayberry. 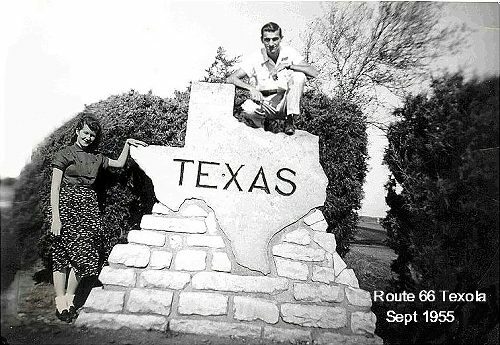 While traveling from St. Louis to Amarillo in 1955 we took the old highway Route 66. We stopped at the border of Oklahoma and Texas going west. This photo of me and my wife was taken by that great granite Texas monument. It was 1955 and we were on our honeymoon - that's why the marker is so special to me. 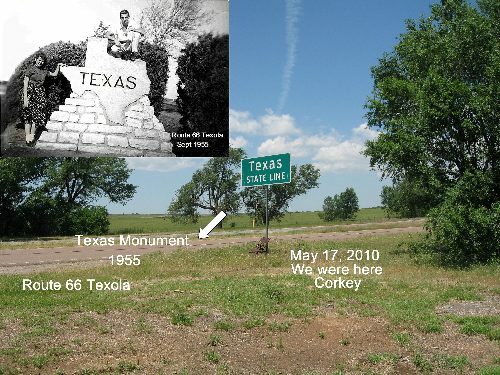 The monument was between the two divided lanes of Route 66. It appears as if there was a bullet chip between the E and X.
I've been there five times since 1955 looking for it. I sure would like to find out where that marker is. 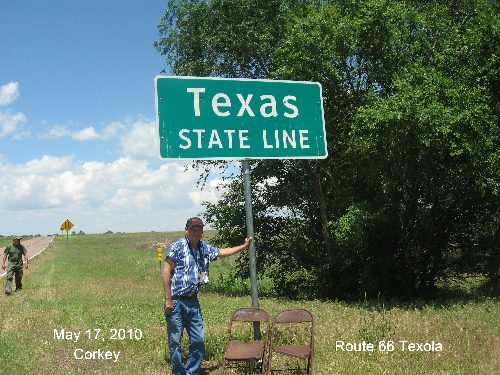 We were there in Texola on May 17th 2010 - still looking, but with no luck. If anyone has any information on what happened to the marker, they can contact me at: corkeymayberry@yahoo.com or they can write to Corkey Mayberry, 5727 Mayberry Lane, Park Hills, Missouri 63601. I will never forget the wonderful memories of Route 66.